The Event Center at Plaza Lecea is a family-owned venue that caters to our client as if they were family. Plaza Lecea blends classic and contemporary design to create an unparalleled ambience for your wedding ceremony and reception. 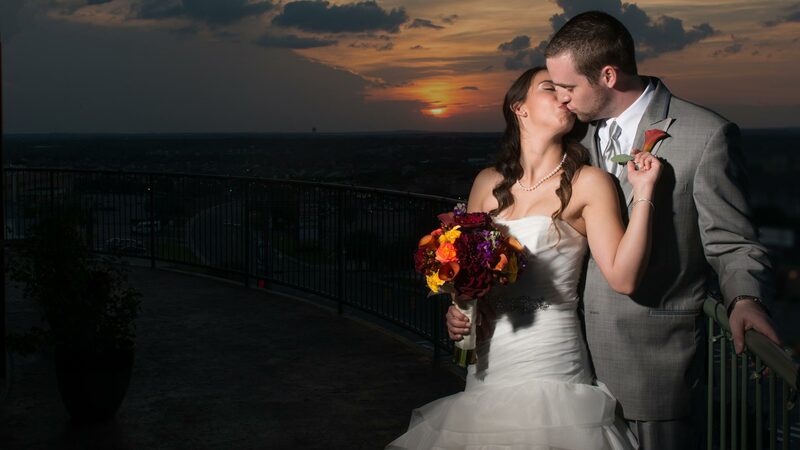 As San Antonio’s premier wedding reception venue, the ballrooms of the Event Center tower 65 feet above ground, providing you and your guests a picturesque view of San Antonio and the Texas Hill Country. In addition, we offer custom floor plans and packages. Variety of fabrics including pintuck, satin, taffeta, embroidered overlay, lace, damask, and more! Plaza Lecea offers brides the opportunity to host their on-site ceremony with the choice of a Panoramic View Ceremony or Grand Stair Entrance Ceremony. Rehearsal time is included at no additional cost. Our brides have the opportunity to make a grand entrance down our spiral staircase into our grand entrance lobby which can accommodate up to 100 seated guests. The grand entrance lobby, with two-story windows, exquisite audio sound to highlight the bride’s entrance and gorgeous lighting, provides a modern backdrop for any wedding ceremony. You also have a choice of our Panoramic View Ceremony in our penthouse suite with views of the Texas Hill Country as the backdrop to your ceremony. With accommodations for up to 100 guests, you can exchange vows with the sun setting in the background. Additionally, our bridal room is complete with comfortable chairs, large counter area, make-up mirrors, floor-length mirror, and ornamental hooks to display your wedding and bridesmaid’s dresses. Whether you have your ceremony at Plaza Lecea or off-site you can refresh in the bridal room after an offsite ceremony, relax prior to your reception, or change for your honeymoon exit. For more information or to schedule a tour of the Event Center, you may contact us for pricing and availability by completing this form. We will contact you shortly!